AMD Gaming On The Go Experience the all AMD performance of the latest Ryzen 5 Processor being paired with the Radeon 560X series GPU. The Ryzen processor which has quad cores and eight threads and is capable of speeds of up to 3.7GHz. Not just built for gaming the FX505 AMD Edition allows for faster, more efficient multitasking, including daily productivity tasks, surfing the net, and watching movies and videos. Featuring a cutting-edge IPS level display with a minimal 6.5mm bezel allowing you to gain engaging visual immersion and super-smooth gameplay. It’s also tested and certified to military-grade MIL-STD-810G standards, so you’re guaranteed toughness and durability that’s second to none. 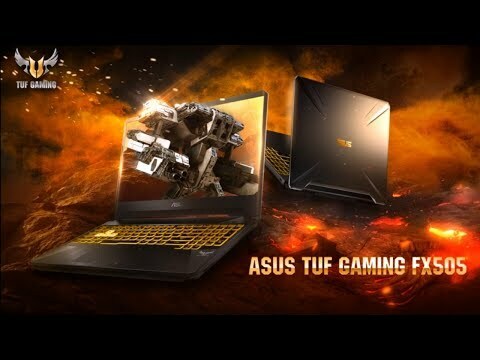 15.6" ASUS TUF Gaming FX505DY-BQ001T, FHD FreeSync, Ryzen 5 3550H, 8GB DDR4, 128GB NVMe SSD+1TB HDD, 4GB RX 560X, Win10 is rated 5.0 out of 5 by 1. Rated 5 out of 5 by Shazsam from Could not be happier. Amazing performance Took a risk and it paid off big time. AMD cpu and gpu seem to be a superb combo for gaming laptop. Most bang for yer buck!